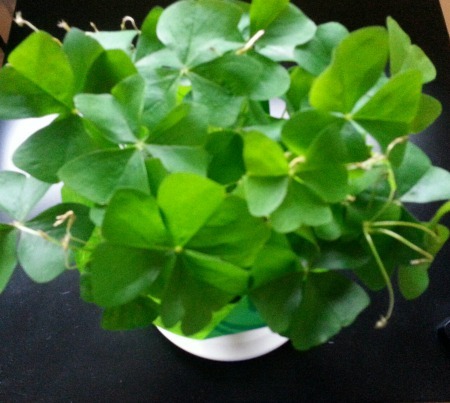 This entry was posted in Seasonal and tagged Irish blessing, Shamrock plant, St. Patrick's Day. Bookmark the permalink. Seriously?? How cool — must be the leprechauns at work!! Happy St. Patrick’s Day!! May you be in Heaven a full half hour before the Devil knows you’re dead. Said first by someone else, but always said by my great aunt when you sneezed. Have a LUCKY DAY! What a lovely sneeze blessing! Probably comforting, too, to a mischievous child, ha! No Chicago River pictures this year — Domer refused to brave the madness — but as you can see, Fiona II is in bloom! Happy Green Day to you! Enjoy your holiday, Debbie! Thanks, my green-loving friend! Hope your day is perfect! What a great post, Debbie, both your photograph and the words! HAPPY ST. PATRICK’S DAY, my friend! Happy St Patrick’s Day Debbie. Right back atcha, John — thanks!! FF, any time you stop by is fine with me — hope your St. Pat’s Day was grand!! Hey Captain, good to see you around these parts! Happy wearing-of-the-green day to you, too! Hope you had a great St. Patrick’s day, Debbie. My Spring break has been a blur. It was great, Lana — hope yours was, too! Nice to get a Spring Break, ha! Yes indeed, nice to get one at all! What a beautiful green plant. Just when we need some green. Hope you had a nice St. Patrick’s Day. I was traveling so lost touch with it this year and just wanted to get home from the airport before all the partiers were on the roads. Yikes! This is the second shamrock plant I’ve had. The first one didn’t make it, so I’m hoping I’ll have more luck this time around! Glad your travels were safe!! My great great great grandmother was Irish. My maiden name is McKelvin. Who would ever guess that about this black woman…LOL! So yeah…this is my holiday! I made corned beef and cabbage 2 times this week. I’ll bet they were delicious, Tanya! I’m not one bit surprised that you’ve got Irish ancestors — I imagine all of us are a big melting pot when it comes to our lineage.